It's been a long time since I have posted. Too long as a matter of fact. I promise to make a point to try to update more often. This past year has brought a slew of changes including a slap in the face reality that we need to change our diet and lifestyle. I will go into that later. We are slowly but surely changing our lifestyle into one that makes a point to have fruits and vegetables as our main course and to replace low nutritional value per calorie foods with those that have higher nutritional value. I don't know about you, but I personally like dressing on my salads or for dipping. Something I know adds extra calories with low nutritional value. It's hard to give up the flavor! In order to provide nutrition without loosing my urge to dip, I have been experimenting with homemade hummus. Hummus is jam packed with nutrients and health benefits. Check out this webpage for a good explanation of the nutritional goodies. 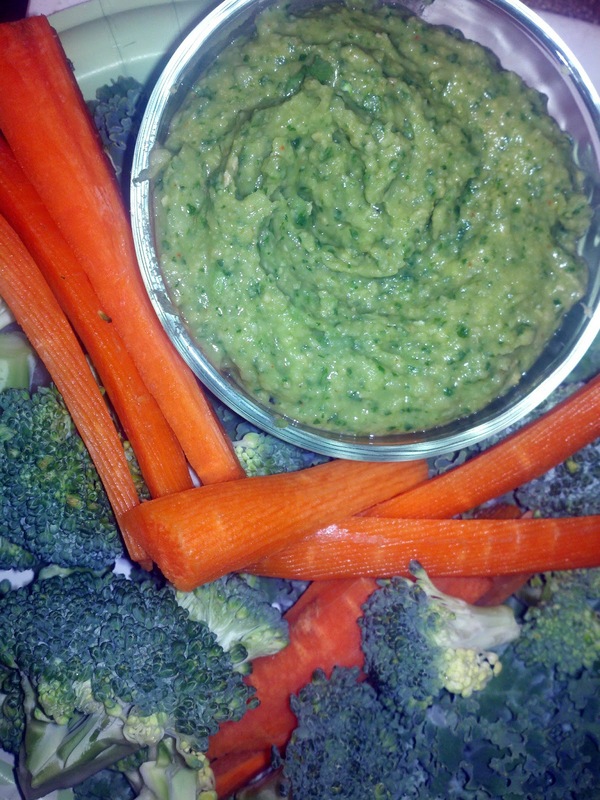 My favorite concoction, and least complained about by my son, is my Cilantro Lime Hummus. *Please note that most Hummus includes Tahini. This certainly is not an ingredient that I have in my kitchen so I left it out. Place all of the ingredients in a food processor and start blending. Slowly add the remaining liquid (I don't measure but I think it I add around 1/4 cup, give or take) until it reaches the pasty, nicely blended consistency. That is it. Experiment with the portions of the ingredients to find the exact flavor you desire. I will place some in a nice leaf of Kale and add some shredded carrots, kohlrabi and other veggies for a veggie taco. It is delish. Enjoy and if you have any variations I would love to hear them.